Superhero Sayings: Everything has a flaw. 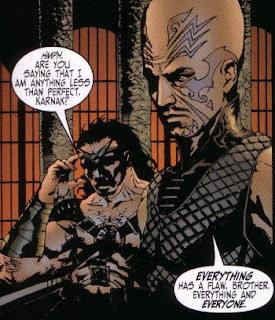 Karnak and Gorgon are discussing the recent actions of their king, Black Bolt, and Karnak follows up this great statement saying that the only person who doesn't have a flaw is Black Bolt. Considering Karnak's skill is in finding flaws in anything it shows his absolute confidence in his king. This is a must-have trade collection which, I would argue, is the best Inhumans story ever written! Over the 12 issues you really get into the hearts and minds of the characters and you can see why this won the Eisner award for Best New Series waaaaay back in 1999!! It's important to remember Karnak's statement because we often put people on pedestals based on their success or abilities but when they let us down we're surprised and sometimes even angry. Instead, when they fail, we should remember how much strength and skill they must have had to succeed despite their flaws! References: Taken from Inhumans TPB (ISBN: 0-7851-0753-3) by Paul Jenkins (writer) and Jae Lee (artist).